By: Joel Erwin Goldstein, Ph.D.
To achieve the desired level of release, humidity resistance, hydrophobicity and other properties, most release coatings today are based on silicone and/or fluorochemical technologies. Fluorochemicals provide hydrophobicity, an important release coating feature that drives performance. Silicone is included in many formulations because it maintains its performance at high humidity and high temperatures and is also hydrophobic. These ingredients give release coatings their essential nature, but they also make it difficult for industry players to adhere to the green principles of reduce and recycle. In the case of silicone, separating the silicone-based release coating from the release paper so that the paper can be recycled is difficult and extremely expensive. As a result, vast quantities of label backing produced every year are destined for landfills. According to a 2009 article in Package Printing magazine, 30,000 truckloads of liner waste are sent to landfills every year. According to one label manufacturer’s website, 36,000 metric tons of waste was sent to landfills in 2011. Release coatings based on fluorochemicals carry potential health and environmental risks, identified in published research. Fluorochemicals are frequently available only in solvents, which have long been identified as a concern. According to a 1980 U.S. Environmental Protection Agency (EPA) report on the tape and label industry, 600,000 metric tons of solvents (e.g., toluene and xylene) were released. Manufactured and shipped in solvent form, release coatings based on these chemistries create a potential hazard during transportation. In addition, when the tape manufacturer applies the release coating during manufacturing of the finished tape or label backing product, the substrate must be dried, resulting in volatilization of the solvent and the evolution of volatile organic compounds (VOCs). Safety measures to prevent potential worker exposures, as well as the use of filters and air scrubbers, to ensure that emissions are in-line with environmental standards, must be employed and regularly monitored. Consequently, tape and label manufacturers have sought alternatives that would allow for a more environmentally responsible manufacturing process and product lifecycle. Many tape manufacturers are seeking solvent- and silicone-free alternatives to reduce landfilled waste, potential emissions, and possible worker exposure. The challenge is finding environmentally preferred release coating products that match the performance of the current standard. To help customers facing these challenges, a family of water-based release coatings has been developed that is free of alkyl phenol ethoxylate (APE)-containing surfactants, free of formaldehyde, solvents or VOCs, and free of silicone. These products provide a range of performance properties, all of which have advantages over currently available commercial products. One new product positioned to have an impact on the environmental profile of release coatings is a release polymer*, produced from a novel monomer prepared via a solvent-free production process. The waterborne polymer is produced via emulsion polymerization with APE-free surfactants. When a coating composition based on the release polymer is applied, the resulting coating is comparable in performance to current commercial solvent-based coatings. When applied to paper, the finished product is repulpable, which means it is easily recycled, an environmentally preferred alternative that enables producers to avoid landfill waste. Many fluorochemicals contain a reactive moiety such as isocyanate, which requires activation by a catalyst. This new release polymer, however, does not require activation for efficacy and needs no catalyst to obtain release properties. It can be used with all of the most widely used adhesives such as hot melt, solvent-based NR and water-based acrylics. Common test methods have been used to demonstrate that this alternative is a suitable replacement for those that currently pose an environmental concern. A key characteristic that all high-performance release coatings share is hydrophobicity. 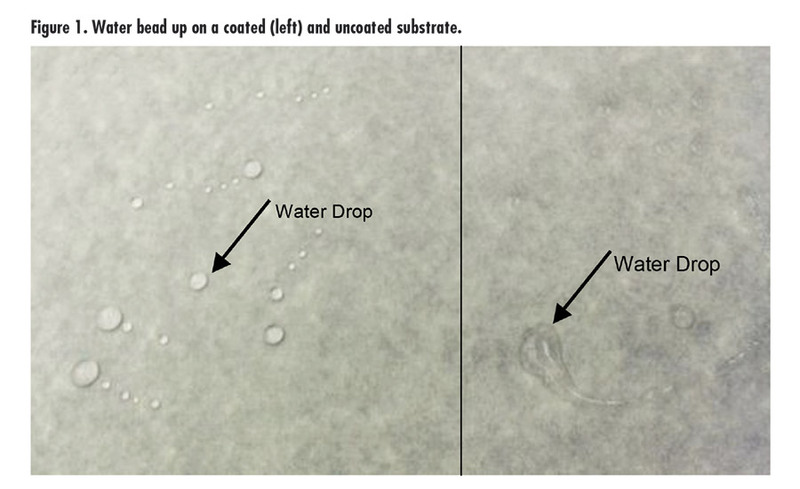 Figure 1 shows how water beads up on a substrate coated with a composition based on the release polymer vs. the same substrate without a coating. This indicates strong hydrophobic performance, minimizing the water’s contact with the release liner surface. To evaluate hydrophobicity in quantitative terms, the contact angle of water on a film made from the release polymer vs. that of a siliconized release liner was examined. 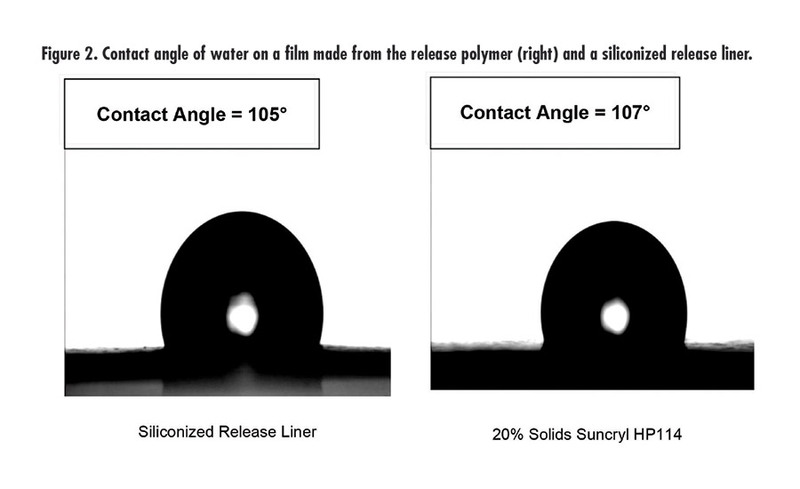 As can be seen in Figure 2, the release polymer film has a greater contact angle than does the siliconized liner, indicating equal or greater hydrophobicity. All of these properties are achieved with a material that advantageously is repulpable. Another key characteristic of a release coating is its ability to adhere itself to the substrate while providing easy release to the adhesive surface of the facing material (e.g., a tape or label). When the release liner fails in this regard, it is pulled from the substrate and sticks to the adhesive side, contaminating the adhesive and reducing the utility of the tape or label. 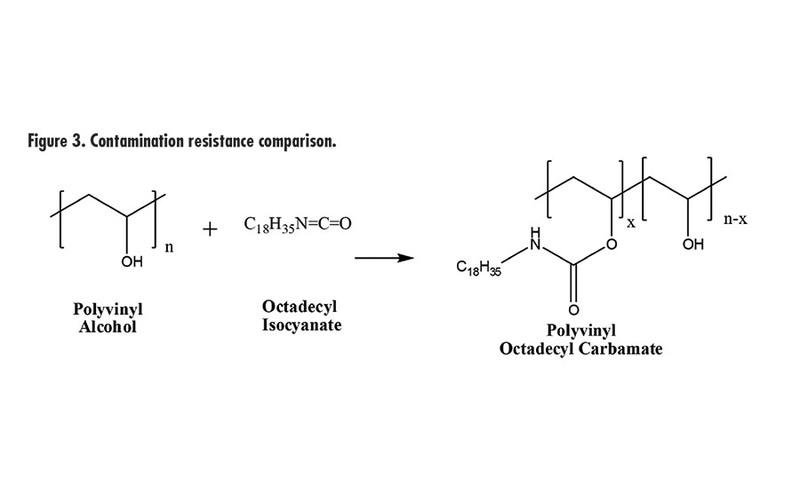 To test contamination resistance, the new release coating polymer was compared against polyvinyl octadecyl carbamate (PVODC), a material used in release coatings available in three forms: solid, dilute solution in toluene or xylene, and water-based dispersion. As a control for testing purposes, the water-based version of PVODC was used (see Figure 3). The peel and contamination performance of the release polymer was compared to that of PVODC using three widely used adhesives: a natural rubber-based adhesive, a hot-melt adhesive, and an acrylic water-based adhesive. The release coatings were evaluated against all three types using the ball tack test to measure contamination. In the test, a wound tape was created by applying a release coating to one side of a substrate and an adhesive to the other side. This “tape” is then wound and unwound. A ball was then run along the adhesive side. The further the ball traveled, the more contaminated the adhesive became (indicating the release coating stuck to the adhesive, making it less sticky). In the results shown in Table l, smaller numbers indicate lesser amounts of contamination when the tape strip was unwound and better maintenance of adhesive properties. The release polymer performed well in comparison to a major solvent-based polymer release agent in the ball tack test. When using the release polymer in film applications, we recommend the release coating composition be dried at an elevated temperature. This allows the hydrophobic groups on the polymer to align, thereby providing optimum performance. As seen in Figure 4, performance of the release polymer is very temperature dependent. 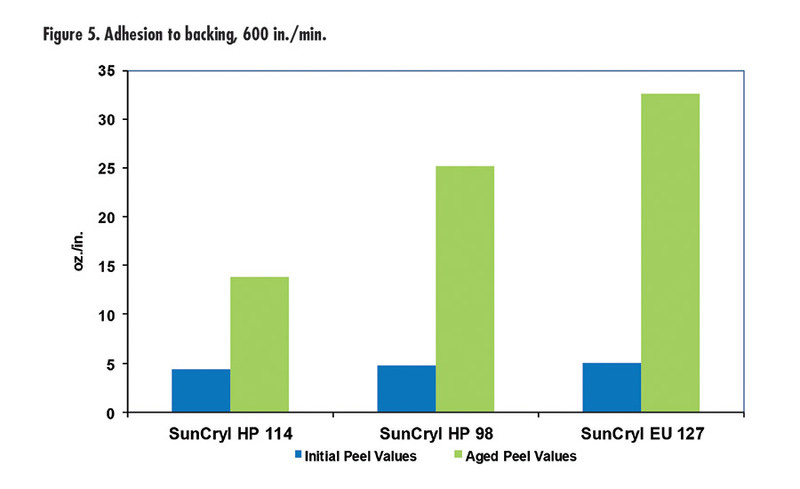 Another key requirement for release coating performance is resistance to heat and aging. The ability of a tape or label product to perform after being warehoused for extended periods, often under environmental extremes (such as a high temperatures and/or humidity), can greatly impact the performance of the product. 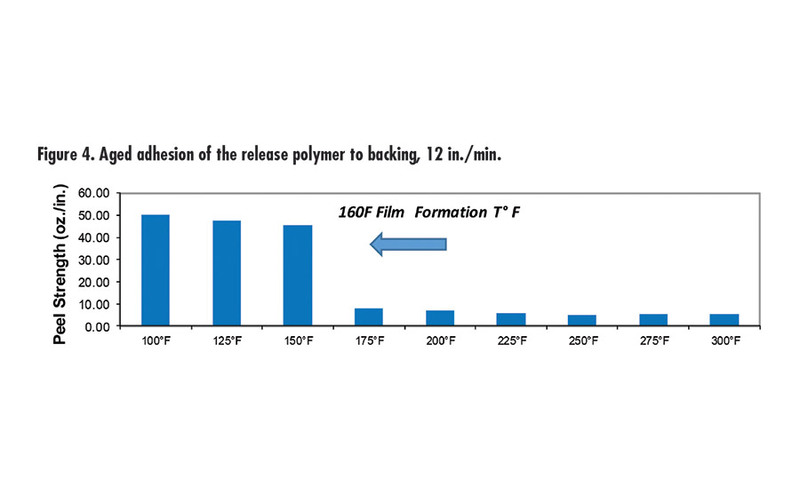 Figure 5 shows results of tests that compare the performance of the release polymer against the other release coatings in the new family of release coating products. All three polymers initially exhibit excellent release. To simulate the extreme storage conditions that tape and label products must often endure, they were subjected to 150°F and 60% relative humidity for 16 hrs. Based on a novel monomer, the release polymer has already proven successful in applications for film tapes. Offering strong hydrophobic performance, contamination resistance, and heat and aging resistance, it eliminates the need for silicone in end use, resulting in a completely repulpable product. Additionally, it offers the ability to reduce the environmental risks and burdens imposed by solvents or fluorine-based products. This polymer can be blended with other products, such as those shown in Figure 5, enabling the creation of unique release coating formulations for specific applications. Work is ongoing to leverage this new technology for more applications, widening the range of release strengths it can provide and further enabling the reduction and elimination of older technologies, allowing more environmentally preferred end use products to be developed.